Recently, many cities, school districts and other public entities have had their election systems challenged under the California Voting Rights Act of 2001 (CVRA), leading to very expensive and divisive litigation. The Etiwanda School District’s Board of Trustee’s preference is, and always has been, to avoid expenditures that do not directly benefit the children, families, and communities we serve. While the Etiwanda School District believes its elections have not been racially polarized, a move to by-trustee area elections enables us to move forward without the potential of having to defend CVRA litigation in the future. In order to ensure compliance with the CVRA or, at minimum, avoid the potential for costly litigation under the CVRA, on May 11, 2017, the Board of Trustees approved Resolution 1617-70, Initiate the Process of Establishing Trustee Areas and Elections By-Trustee Areas. The resolution initiated the legal and regulatory process to establish trustee areas within the District, as provided in Education Code section 5019; changing the method of electing members of the Board, from the current at-large system, to a method which provides that Board members residing in each trustee area will be elected by the registered voters of that particular trustee area (Education Code 5030(b)), in sufficient time for the new method of electing members of the Board to be in place for the November, 2018 election. The process of establishing trustee areas and transitioning to a by-trustee area election method requires public input, multiple public hearings, and the involvement of the San Bernardino County Committee on School District Organization, as well as potentially seeking and obtaining a waiver of the requirement for an election from the State Board of Education. The District initiated the creation of election areas that would be roughly equal in population and in compliance with State law, the Federal Voting Rights Act, and the United States Constitution. Using data from the 2010 Census, the District’s consultant, Cooperative Strategies, created conceptual trustee area scenarios that divide the District into five new voting areas. The District hosted a series of public meetings and hearings, and provided information and a feedback link on the district website, to collect community input regarding the proposed area maps, allowing community members to view the conceptual trustee area scenarios and provide comments. 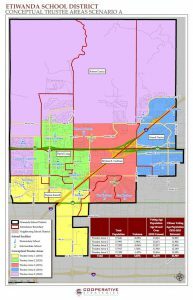 Following community input, on October 9, 2017, the Board of Trustee adopted map scenario A as the final map. The Board also approved Resolution 1718-26, Recommending the San Bernardino County Committee on School District Organization Approve and Establish Trustee Areas from which the Etiwanda School District Trustees will be Elected in a By-Trustee Area Election Process. On October 26, 2017, the Board of Trustees conducted a public hearing to consider a waiver request to the California Department of Education to waive the requirement that the establishment of trustee areas and adoption of a “by trustee area” election process be submitted to the electors as set forth in Education Code Sections 5019 and 5020. Following the public hearing, the Board approved Resolution 1718-28, authorizing submission of the general waiver request to CDE. The San Bernardino County Committee on School District Organization conducted a public hearing on November 15, 2017 and unanimously adopted County Committee Resolution 20171115, approving the district’s plan to transition to by-trustee area elections. Resolution 1718-28 Authorizing Request for Waiver of the Requirement that the Establishment of Trustee Areas and Adoption of “By-Trustee Area” Election Process be Submitted to the Electors as Set Forth in Education Code Sections 5019, 5020, 5021 and 5030.